If you’ve been following me on Instagram (@playcrafts), you’ve seen this quilt come to fruition. The fabric was kindly donated by RJR Fabrics in return for them getting to hang the quilt in their booth at Quilt Market in Houston. When they approached me, I’d already been playing with a design and they were happy to let me run with it. The design of course, has a story. Two weeks after I signed the paperwork at my new job and found a place to live in Orlando (but before we’d actually moved), the biggest mass shooting in the US to date happened at the Pulse nightclub in Orlando. I wept for my new home, and wondered how I would fit in to a place where such a thing could happen. But the way Orlando responded gave me hope; there was no hesitation to help, no backlash that many of the victims identified as LGBTQA, that many were Latinos. Now that I’m here, I can say that Orlando is one of the friendliest places I have ever lived. Getting to know people here, so many of them were affected by the shooting in some way. As I listened to their stories of loss and rebuilding and hope and sadness, I mourned with them and wished I’d had the chance to know the people they had loved and lost. With the stories in mind, I began working on this design. The design is an abstraction of the skyline of Orlando as often depicted, with the city’s lights reflecting in Lake Eola. There are 49 light squares/blocks, one for each of the victims killed in the shooting. Losing someone leaves such a hole where their presence used to be, and I tried to reflect that in the way I created this quilt. 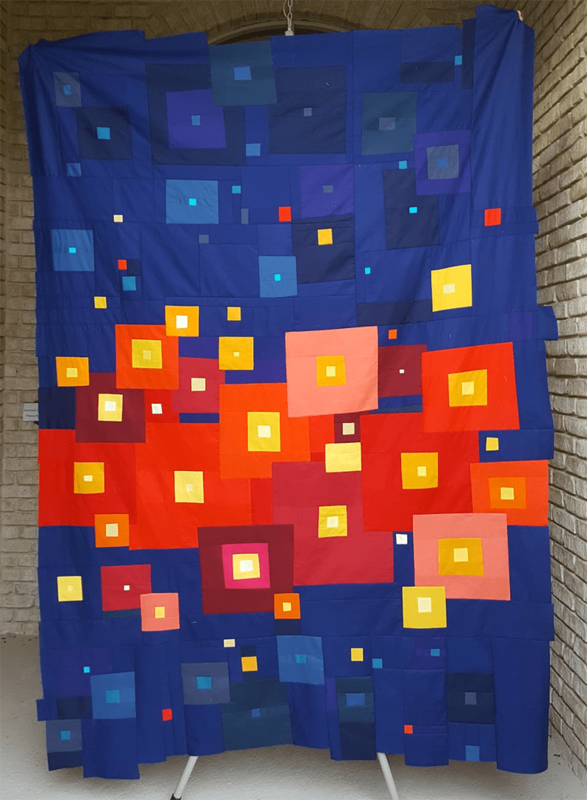 While there’s traditional piecing used in this quilt, the majority of the light blocks were pieced in using inset corners. 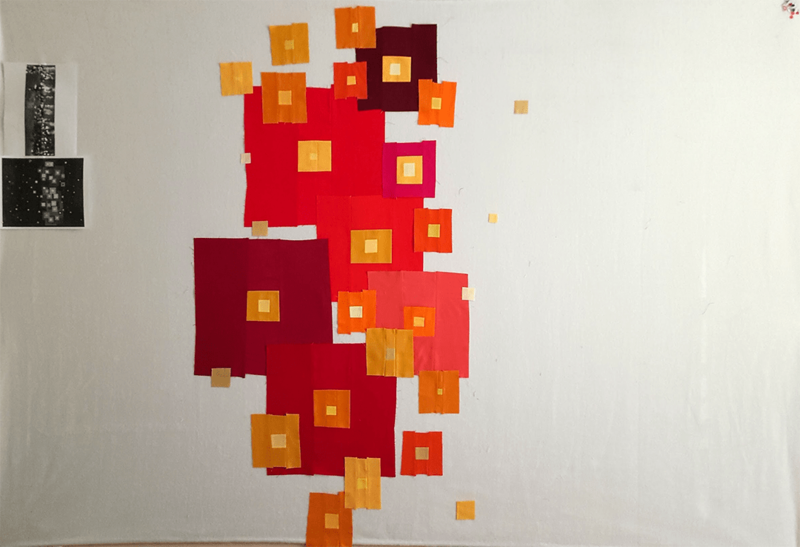 The process requires cutting away the background to make room for the square you are piecing in, and piecing it in whole. In a way, I was attempting to take the holes left by those who had died and patch them with light. If only it were as easy to do that in real life. This quilt truly was a labor of love in so many ways. It’s a quilt of loss, but also a quilt of hope. It’s a quilt for my new home and my new friends. But mostly it’s a quilt for the 49 people who unfairly lost their lives and the light they left behind. My first impression was of “lights”. I like this new direction. Encore! encore! Thank you! I want to do more of this sort of thing, but I’m having trouble narrowing in on colors I want to play with. The problem with liking all the colors, I suppose. I love the story and all the thought that went into this quilt. It looks beautiful but knowing the background makes it so much more special! Ditto. And I love the play of light and dark colors. it really is a beautiful quilt, and the story makes it even more so! It makes me love it even more. Welcome to Orlando. Although you may not feel so happy about it this weekend. A stunning quilt & beautiful thoughtful meaning as to why you have created it. What a wonderful quilt. I’m so glad I got to see it in person, and I’m glad I got to read more of its story here. Thank you, Mary! I’m ready for a break after this one, phew! 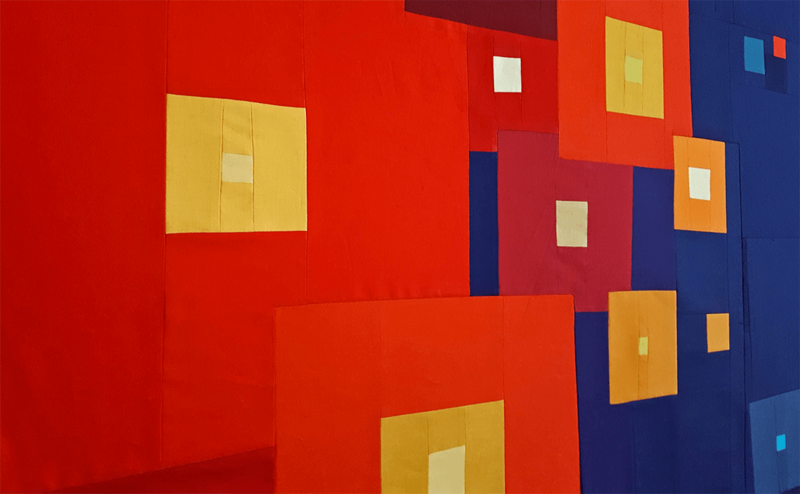 Wow, Anne, this is so stunning and I loved getting to know more about the story and mindfulness behind the process and quilt creation. Seeing your style evolve has been inspiring to me, and I am always going to be a fan of any art that comes from such a measured, thoughtful, and purposeful place. I am so glad that moving to Orlando has gone so well for you (it is 180° from my FL experience, honestly… but I was working in a very strictly conservative male dominated area, so, yeah, it was different (go home and cook in your kitchen where you belong different)). I really wish I were going to be at market; getting to see this in person would be a real treat. Congratulations on the finish and I hope you stay safe through the storm. One of the reasons I was so worried about moving to Florida is that in general, their political leanings do not match well with mine (I’ll just leave it at that.) But it turns out Orlando is its own little bastion of sanity and has a very different feel from the rest of Florida. Which, thank goodness!! I even went to an auto parts store yesterday and the guy didn’t treat me any differently than Eli who was there with me. Very powerful. I so appreciate all the thoughtfulness that went into this beautiful quilt! Thank you so much. I cried a lot over this quilt. I’m looking forward to an emotional break on the next thing I make! The quilt is as beautiful as is the emotion that materialized into this powerful beauty. Congratulations on the new path you’ve found to express your creativity!! Reading the story behind this quilt is amazing. What a work of art. It’s been a pleasure to watch you work on it. Thank you, Jess! I held off sharing the story because I wanted to make sure the design stood on its own, if that makes sense. 🙂 I feel so fortunate that people have responded so well to it! That is gorgeous and the background behind it makes it so thought provoking too. When I saw it in my feedly list it first reminded me of flying over somewhere remote and you see the odd few lights on below and you wonder – who on earth lives there, those below not knowing you can see something of them from up above. Having read the story behind it, it really does show how we interact and affect each other and a person’s loss touches more than you think. The story behind this quilt is terribly sad but what you made from it is so wonderful. The design of it is FANTASTIC!! We need more people like you in this crazy world. People that care and want to try to make it better, even if you only can in a lilttle way. This became so much more than watching your progress on IG! The story behind a quilt is what brings them to life, and you also honored each and every Pulse victim. I love this quilt. I keep looking closer and closer at it. I certainly draws me in. Did you do partitial seams as well as the inset corners? You should be very proud of this quilt! So well done Anne! This is so Anne. A beautiful creation from a beautiful soul. I love this quilt and the story behind it. You are such an inspiration. Your conceptualization is so thoughtful. I enjoyed reading about it, and it shouldn’t go without saying that the quilt is beautiful. I hope it hangs somewhere in tribute. Found your blog. Now I really have a new impression of quilts (I only knew oldfashioned versions). I love the designs!!! and I love the way you get inspired for your quilts. Keep going :)! Thank you so much, Rahel! If you want some inspiration and help getting into improv quilts, I highly suggest The Improv Handbook for Modern Quilters by Sherri Lynn Wood. It is a fantastic book for getting started and providing prompts. I loved this from the beginning watching it come together. It is an amazing finish! It reminds me of stars or fireflies but the true story behind it is so much more important. Thank you so much, Ginny! 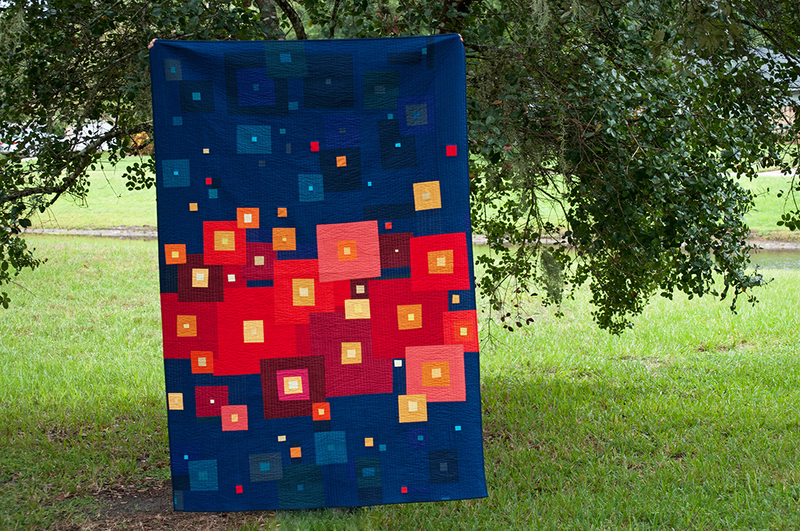 I am super inspired by both stars and fireflies, so it makes me happy that my quilt caused such cool connections. 🙂 I feel like I’m still finding my way with this new aesthetic, but I am loving the experimentation! It’s a great finish…with a great story. amazing. I love it and love your blog. Don’t often comment but this is so special it is worth it. Thanks for posting to blogger. So many people assume everyone does instagram but some of us don’t! Thank you so much, Karen! I really appreciate the kind words. 😀 Instagram is so much easier to post to than a blog, I understand why people have moved there. But I really miss the long form writing so I’m trying to still update my blog while I can. 😀 Thank you for reading! Thank you so much, Rachel! It felt like it took FOREVER to finish it. 🙂 But some things are worth the extra time, I suppose! Loved hearing your story behind this and it is just stunning!! I am so, so, so impressed with this quilt. Thank you so much for sharing the story behind it. Makes it even more special! It’s a beautiful quilt, so well suited to its inspiration. The one speaks to me. I love the design and the colours. Wow, thank you so much, Chris. Love IS love, and it hurts my heart how people still feel forced to hide who they truly are. I somehow missed this post while we were on a trip. I really like this one. I think you’re moving in a good direction. One thing about your quilts is they are not like anybody else’s and they are all so different. I think I love modern quilts more than ever all the time and it’s because of people like you. 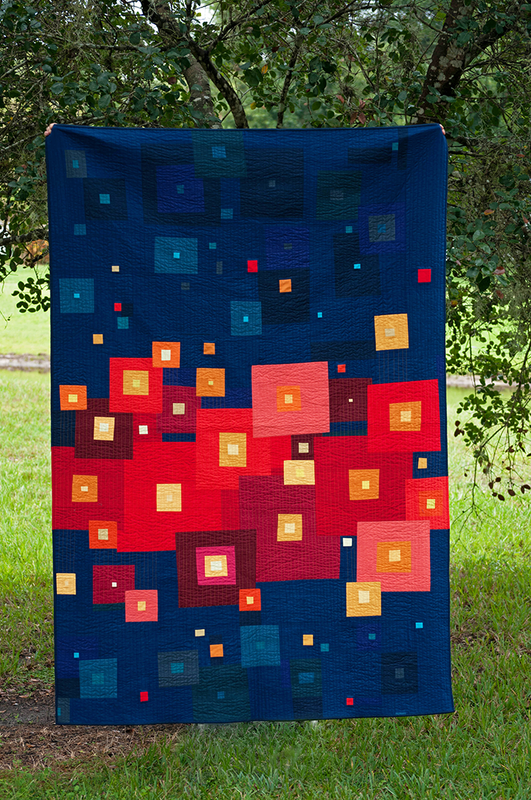 I just saw your quilt mentioned by Yvonne at quiltingjetgirl. Your quilt is so beautifully designed and dedicated. You may be new to Orlando, but I can see that you have already become part of the community with your love and respect. 49 leaves me overwhelmed and speechless. Thank you. The quilt is dazzling, and the story behind it is so intense. Wonky squares are my favorite quilt theme. I understand when you say the squares within the blocks are inset, but how are they secured? By some appliqué technique like machine appliqué, or by hand, like needle turn? Also, I see your layout in progress on your design wall, but how do you join the blocks? Do you cut away the overlapping parts, or just leave them multi-layered? Your quilt is Fabulous! And the story behind it is so emotional! You depicted everything you felt. Wonderful quilt! I am new to quilting and always looking for new ideas. This one Finish 49, is special and catches the eye. I love the use of solids. Could you possibly indicate the sizes of your blocks? I would greatly appreciate a pattern , to capture the quilt design, I know it’s improve but how did you develop the blocks to build on ?Thank you for sharing. Your 49 quilt is amazing and heart felt!!!!!! I would have cried every time I worked on it. You have such a wonderful gift and God Bless you!!! !